I’ll apologize for the rambling nature of this post up front (I promise this isn’t the Saruyama blog, there definitely won’t be any 80’s British, pop/rock video embeds to make you cry….or do the Safety Dance). I’m in an odd frame of mind and you, my dear readers, must suffer for it. Let’s see if you can follow along. There are some trees I’ve been working on. Four or five I think. Maybe eight or seven. Not so sure. There are a few more but I’ll slip them in, just as smoothly as a candiru slipping up an eco tourist’s urethra, as we go along. 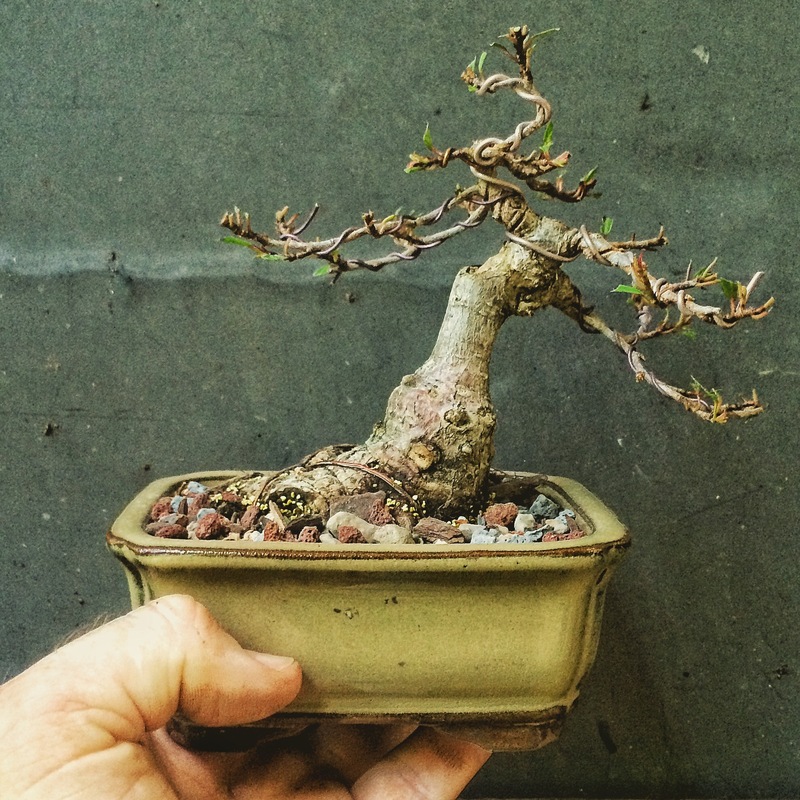 Let’s talk about the big willow leaf. It seems like a good place to start. It looked liked this 21 weeks ago. At least that what Instagram says. Jeez, only 87 likes. If you’re not following me on Instagram, well, why not? I wired and pruned it up at that time but I can’t remember where the after pic is. Maybe in a blog post. They say that cross posting things and having unique content on each web platform is supposed to engage the audience and create brand dominance in your genre. It only confuses me and it doesn’t seem to be working as well as that $19.95 audiobook I purchased (Web Presence for Idiots) promises, maybe I can get a refund….maybe I’m too much of an idiot. 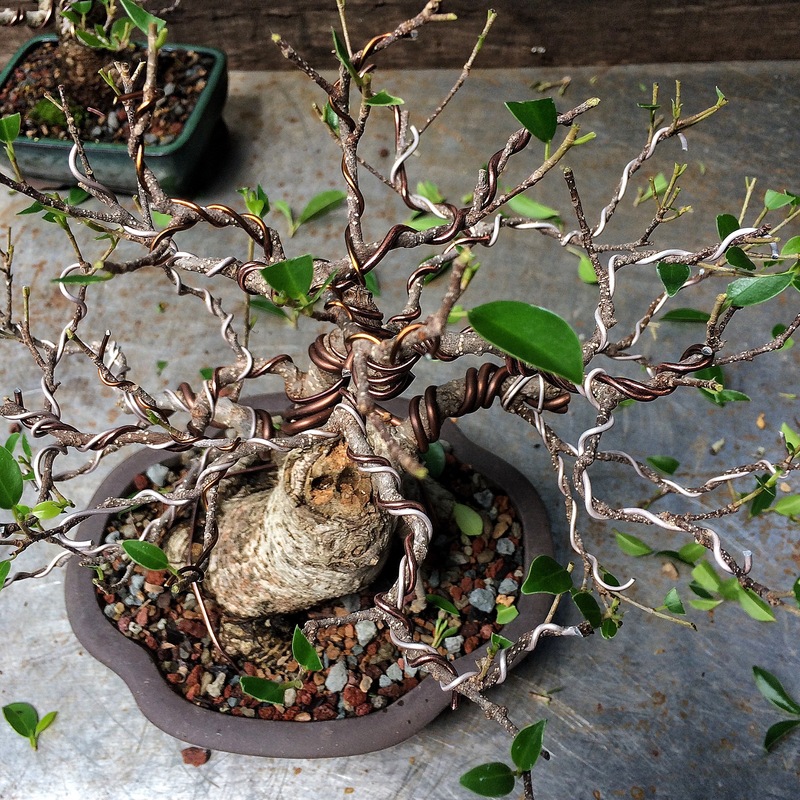 Here’s that ficus today, after defoliation. So’s youse can sees it. Removing the wire you’ll see some wire scaring. This scaring is important. On branches as thick as those, on a ficus, if you don’t keep the wire on as long as I did to cause the scaring, the branches just won’t stay in position. I promise you this. That scaring will grow out, I promise that too. 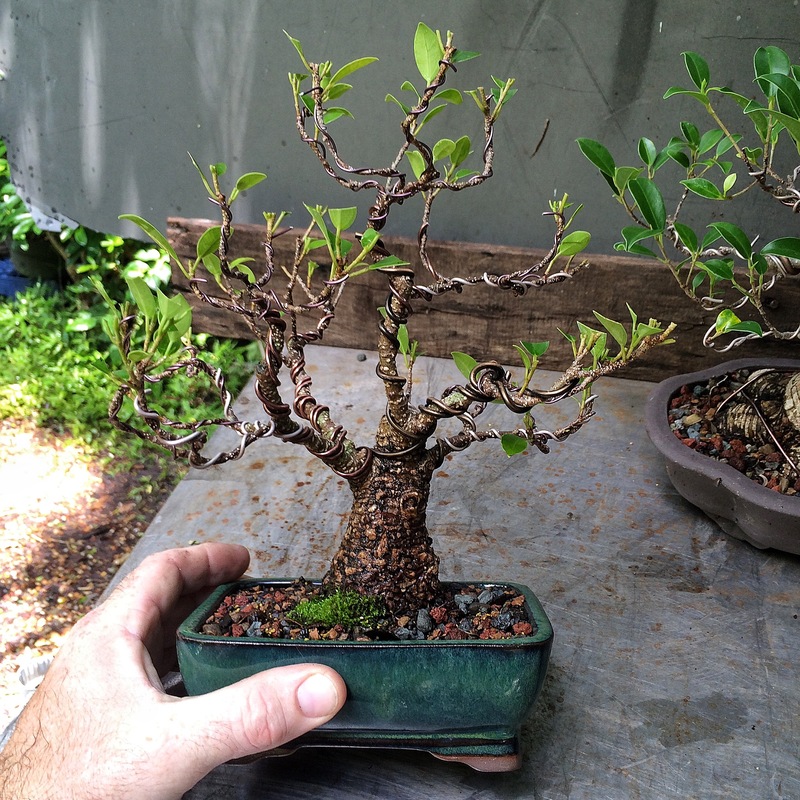 Here’s a f. microcarpa that I did the same thing too. The trunk is worst area of scaring. 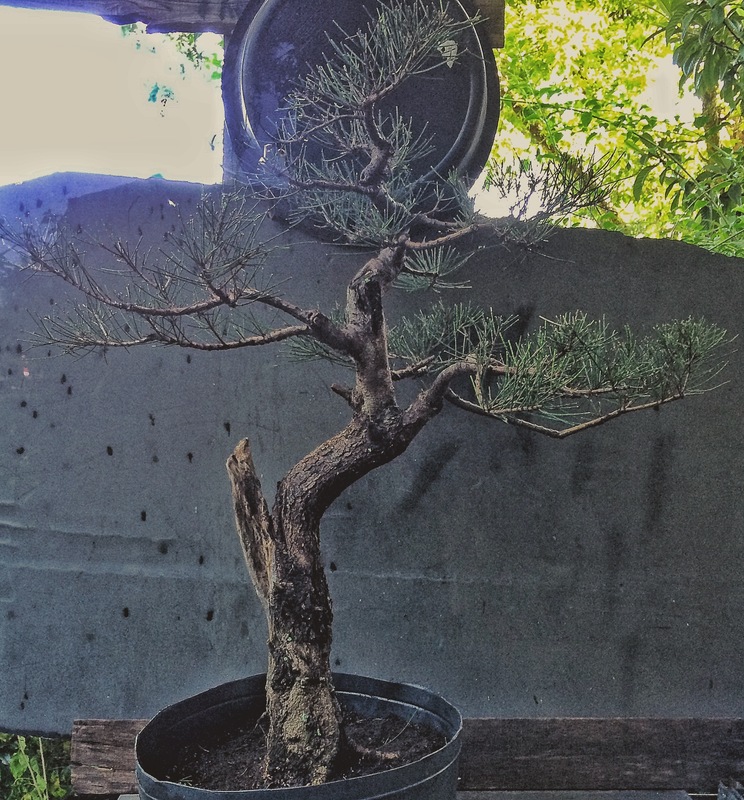 It was originally a side branch that was wired up as the apex, and if I didn’t let it set for so long, it wouldn’t have stayed upright. Instead of a 19 yr old’s profile of a man it would be more like a 40 yr old’s profile. If you know what I mean. I should point out that many artists let the wire cut in to scar a branch just to cause a more gnarly look. If you are doing that, the second step in that process is to wrap the wire the opposite way. And it will mitigate the spiral look. You can also use this technique to help fix reverse taper. Where the top part of the trunk is thicker than the bottom. Getting back to the willow leaf…. I think that’s it. 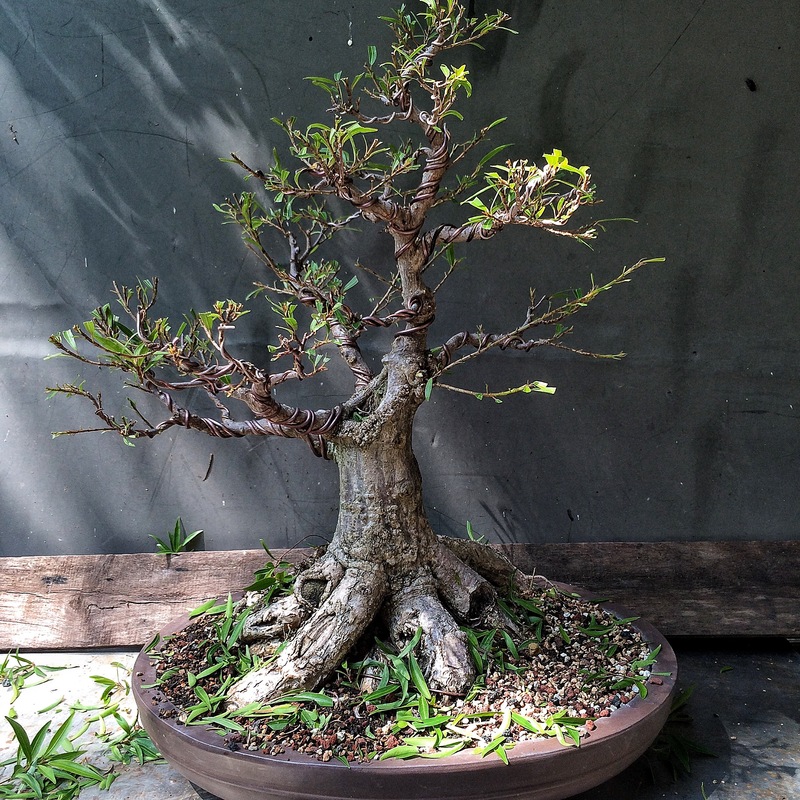 I tip pruned every branch to increase ramification. No wire though, everything is in good position. 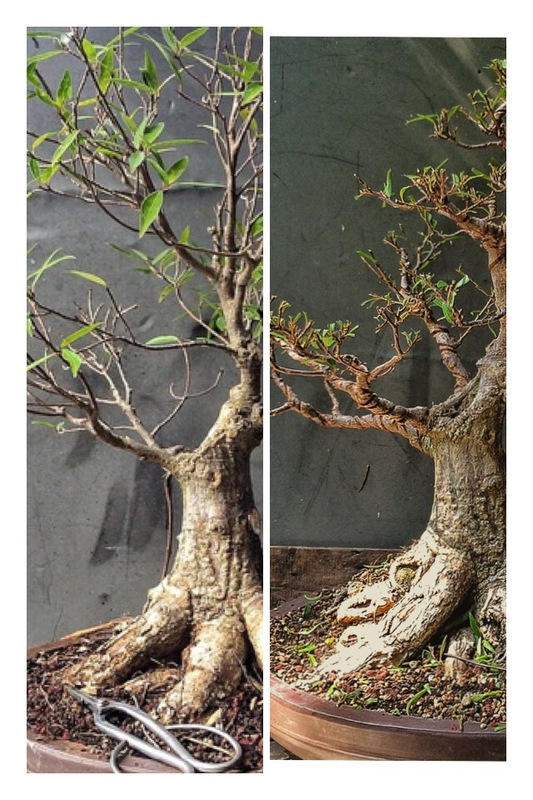 I’m impressed at how much the branches have thickened, especially on the left. It’s good to live in la Florida, except for the transient pedophiles and intransigent pill seekers. 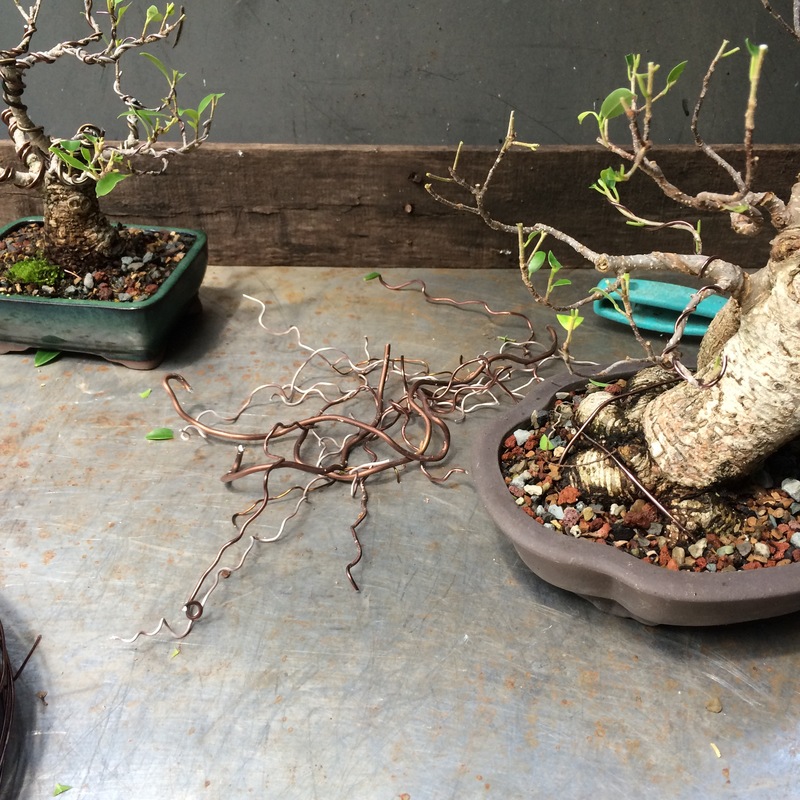 Next two trees….. F. Microcarpas both. Wired at the same time but only one of them repotted. Try to guess which one. That’s right. 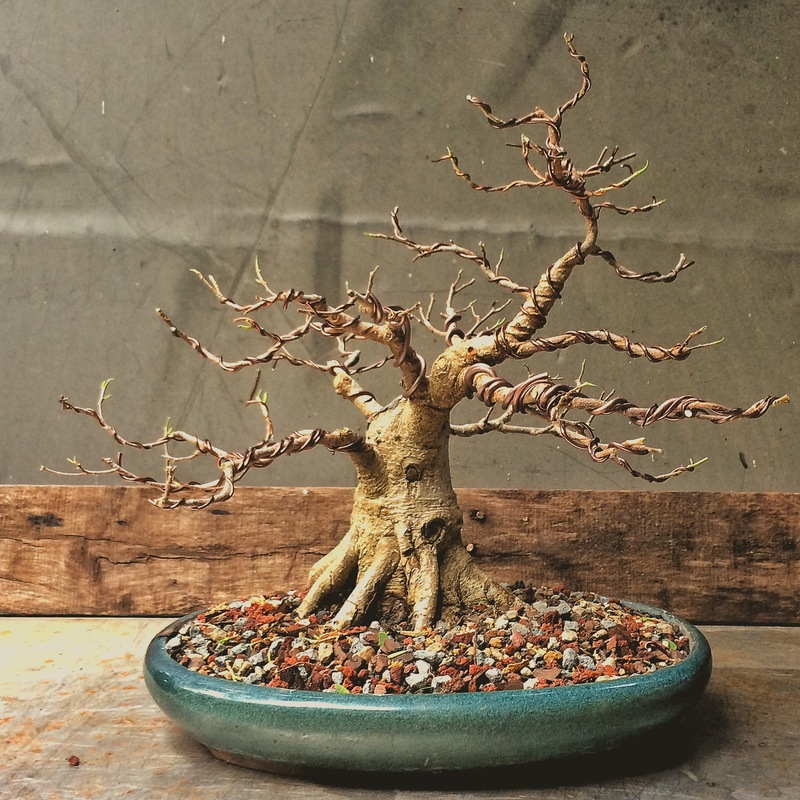 The one with the wire scars was repotted. 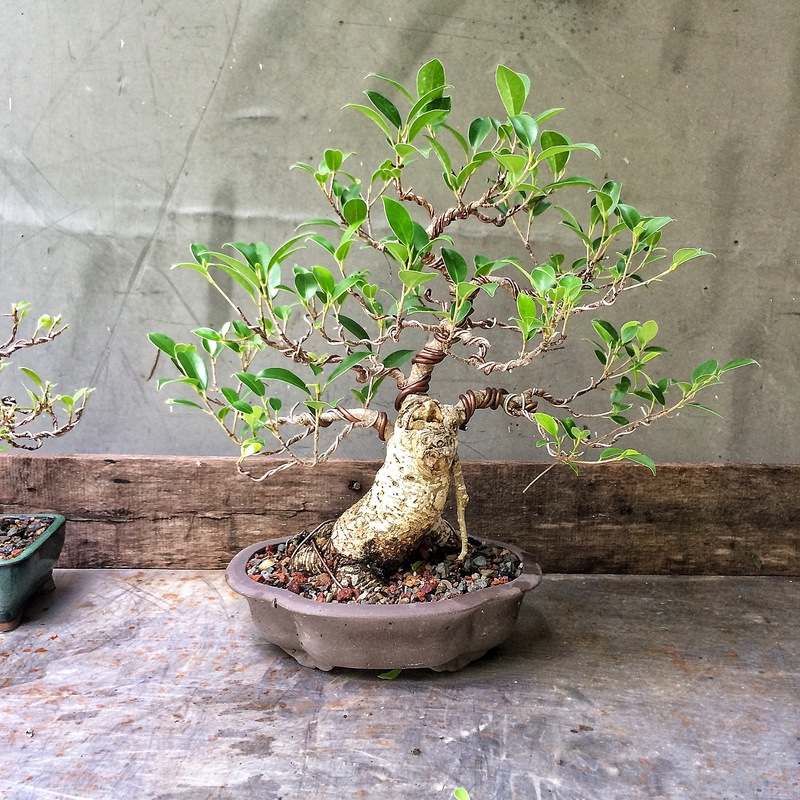 Which proves (anecdotally with a sampling size of two trees and no control…..) that a ficus will respond to repotting with more growth. 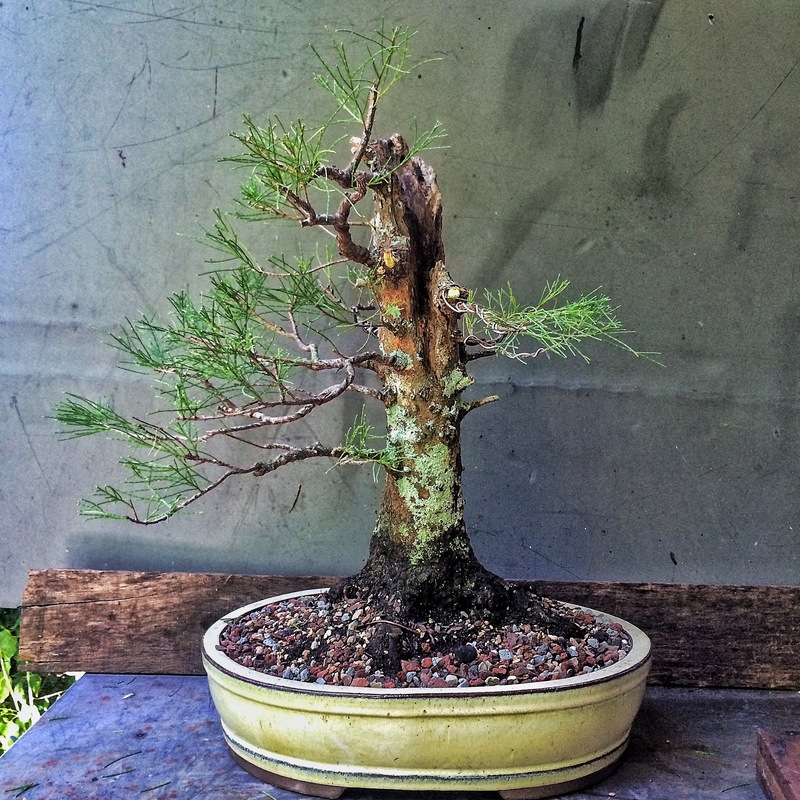 Just to confuse you, this was the repotted tree before the wire was removed. I wanted to show you the labor that it took to remove it all. Whew! That’s hard work. You know, people are surprised that I unwind my wire instead of cutting it off. In fact, I teach that it’s better to unwind wire than the orthodox cutting-off method. 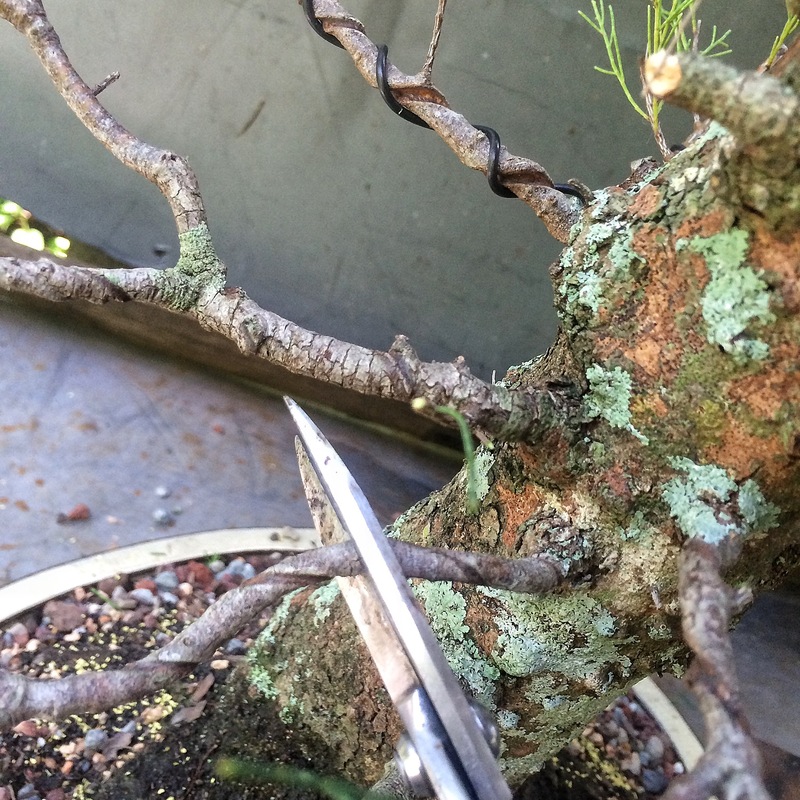 For those who don’t know, in all the books, video, papyrus scrolls offered in bonsai technique instruction, it is taught that unwinding wire off of the branch is dangerous because you could damage the branch you are unwiring. This is true. I have done it. But not lately. Why? 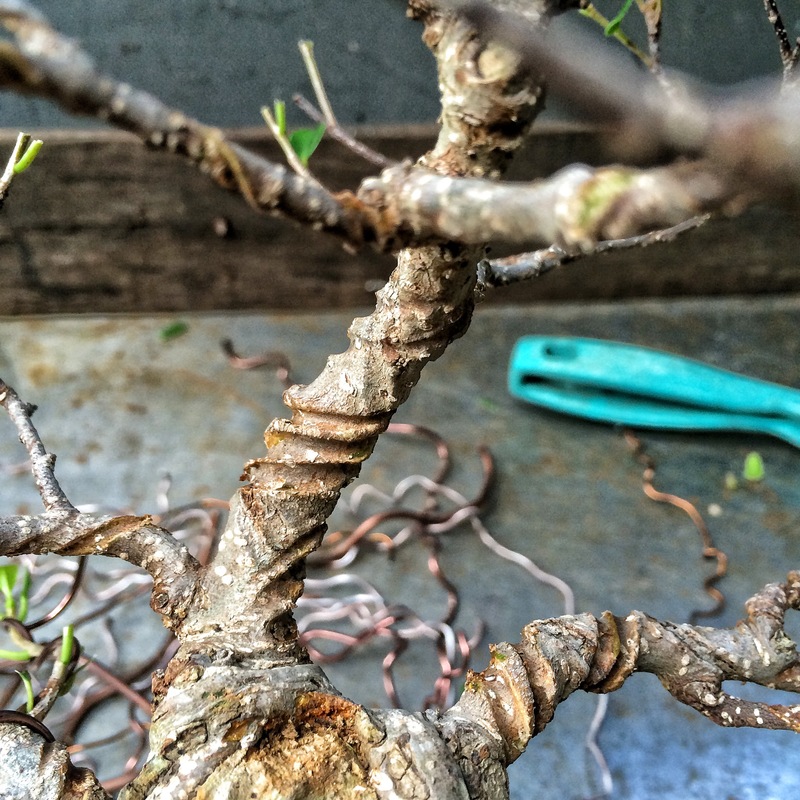 I teach the Adamaskwhy method of wire removal specifically because you can damage a branch. It forces you to be more cognizant of the fragility of the branch and to have more respect for that fragility. 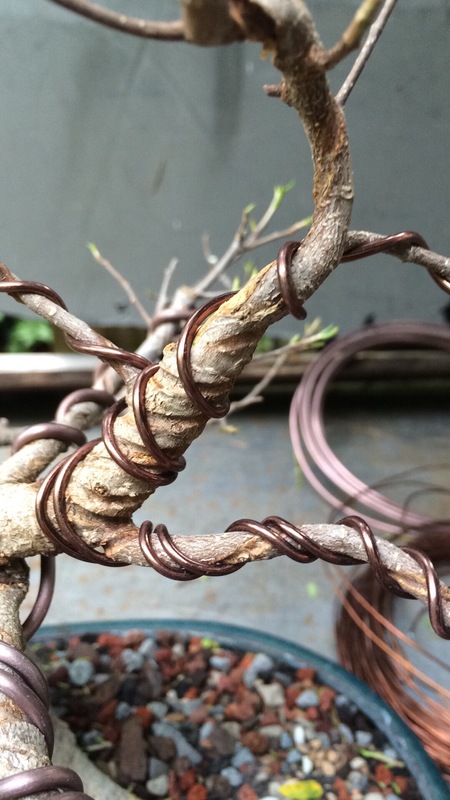 It also increases your comfort level and muscle memory in the motion of winding/unwinding a stiff wire around a branch. In other words, taking wire off makes you better at putting it on. This is why I use aluminum wire almost exclusively. You can’t unwind most copper wire because it stiffens when you bend it. Now, it’s time to tackle the forbidden tree (that sounds funny coming from a man named Adam). 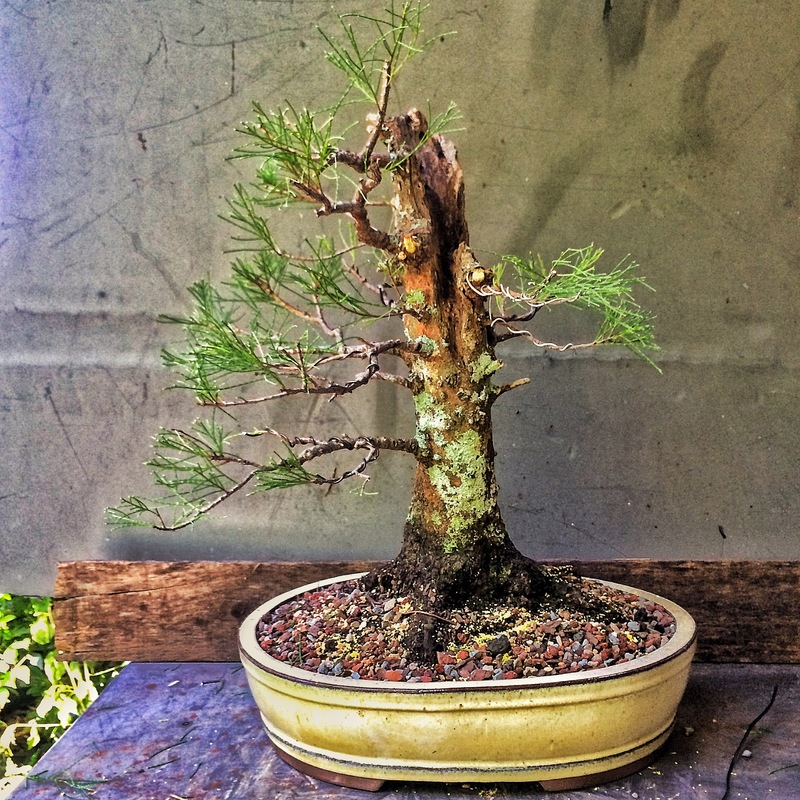 The so called Australian pine, the coast sheoak (coast she oak, coastal she-oak), beach casuarina, beach oak, beach sheoak (beach she-oak), whistling tree, horsetail she oak, horsetail beefwood, horsetail tree, ironwood, whistling pine, Filao tree, and agoho (yes, I copied and pasted that last paragraph from Wikipedia). It is forbidden (on the invasive species list) in Florida (and why you don’t see it for sale here much because of this, not to mention the difficulty in getting collected material to live). 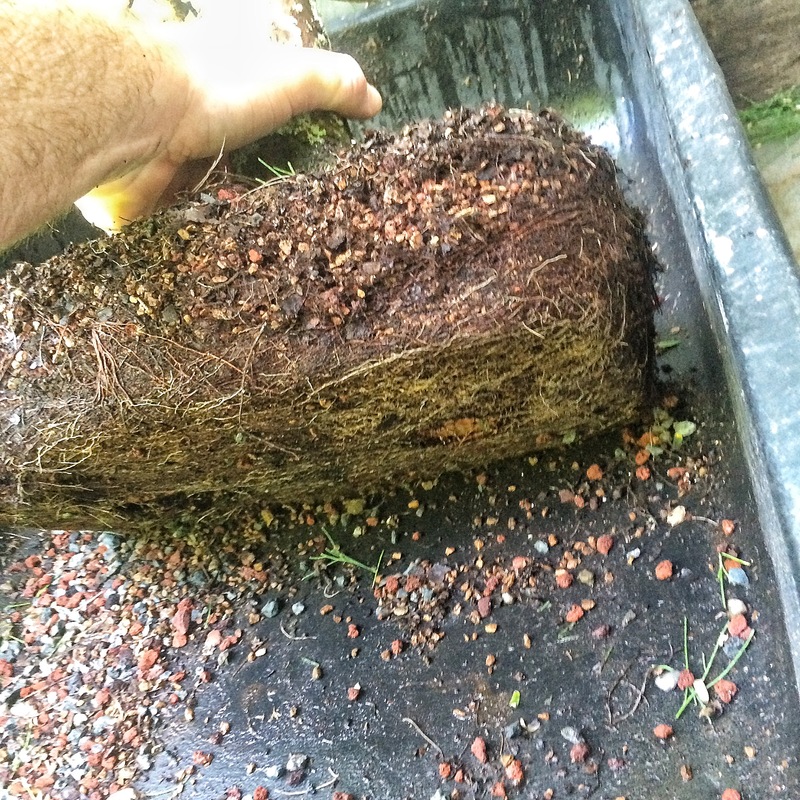 One reason is that the leaf litter has a chemical property that inhibits seed germination (called allelopathy. 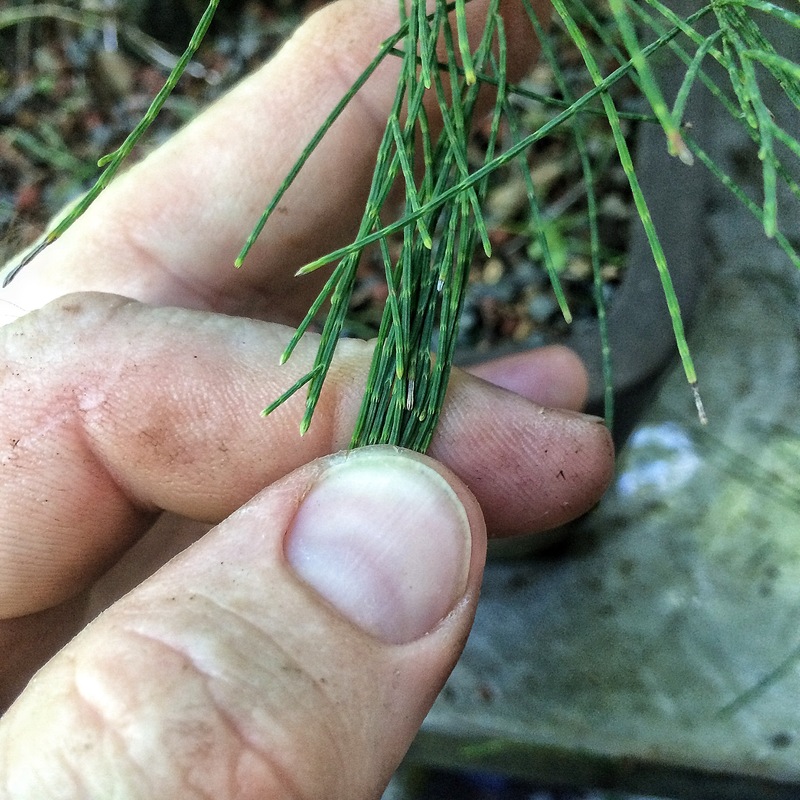 I have an idea: Aussie pines are easier to eradicate from the landscape. 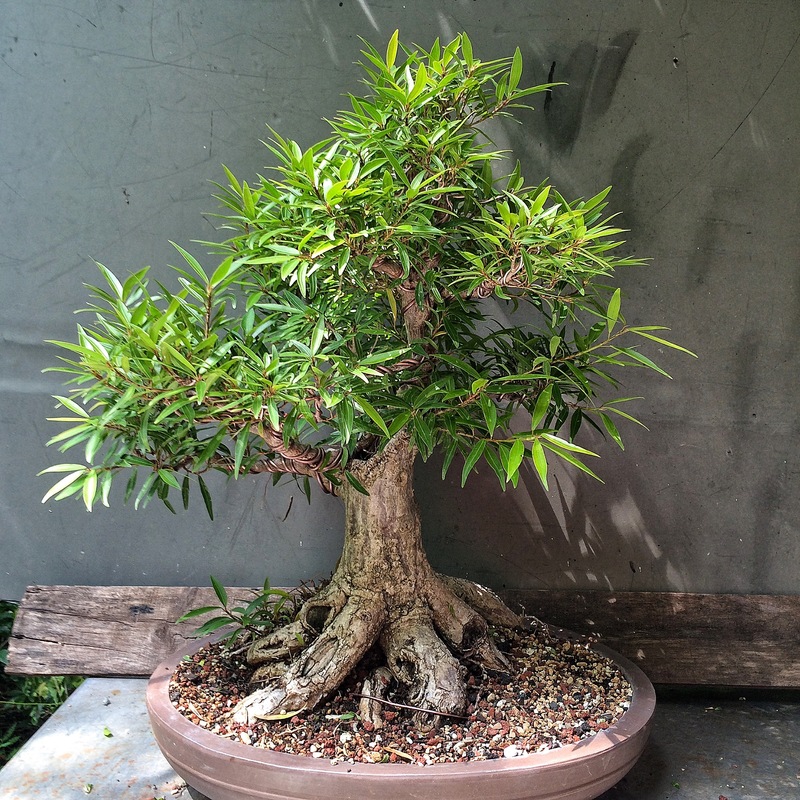 We have another invasive called the Brazilian pepper which is not so easy. It will take a few years but, if we planted more casuarinas in the pepper plant stands, they’ll kill them peppers off. 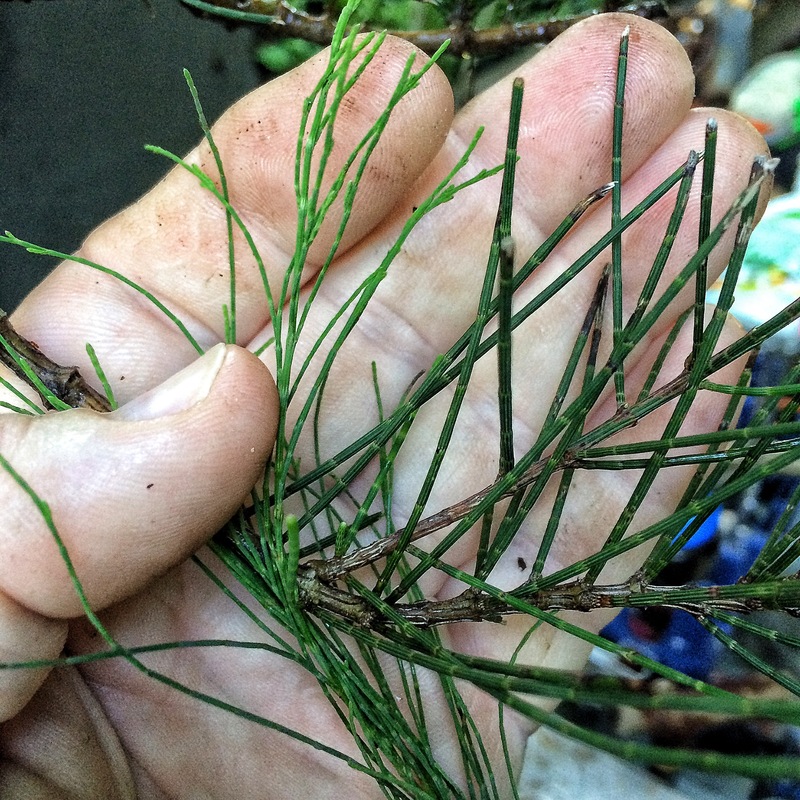 And then we can harvest the Aussie pines for lumber and bonsai…huh? Huh? That’s right, I’m a genius). 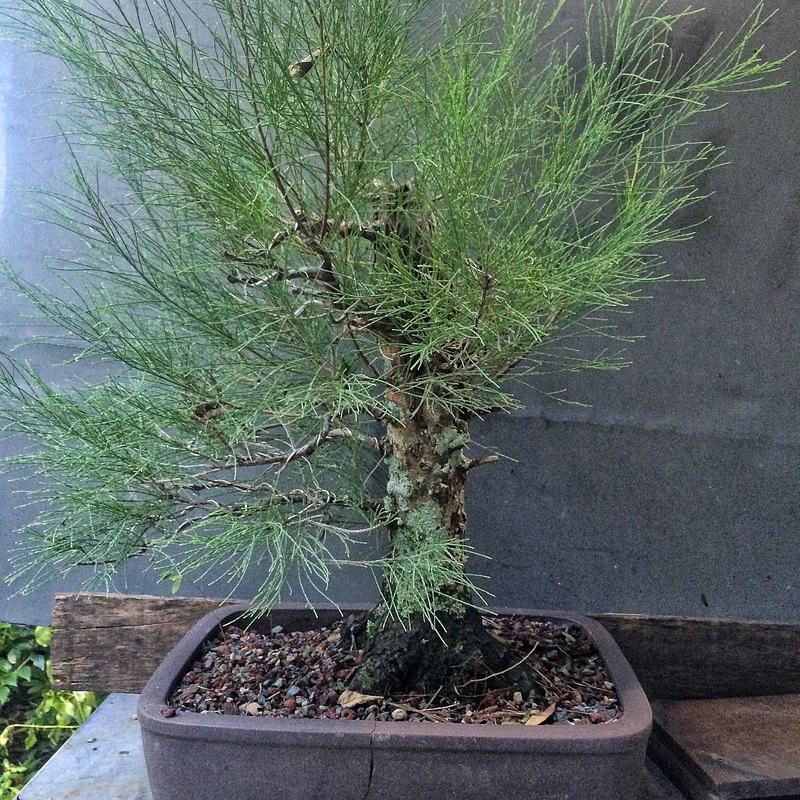 The casuarina isn’t a true pine but a primitive (or highly evolved maybe) tropical plant with a modified leaf form. The needles…. Are actually stem-form leaves Many cactus and succulents have evolved this form. Each one of the segments is, essentially, the leaf. Which means that to increase ramification, you simply trim the needles and you get several new shoots off of the next node. The example above is from a different leaf variety that grows near the Melbourne/Merrit Island FL area. It has considerably thicker needles. The one I’m working on now is the foliage on the left. 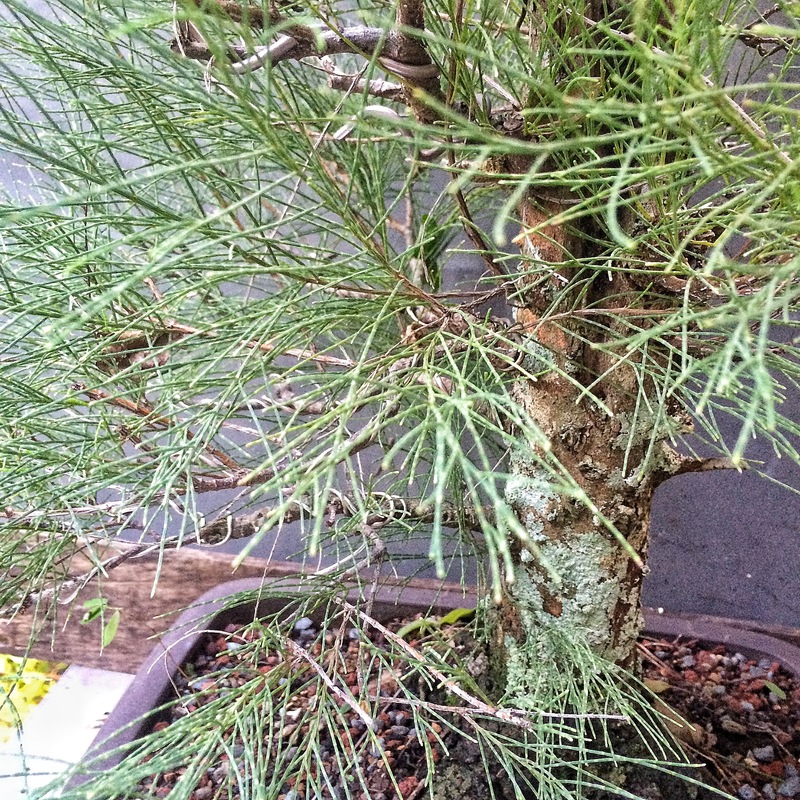 The foliage/tree on the right may be one of the monoecious species of casuarinas out there (c. equestifolia is dioecious, meaning that it produces both male and female flowers on the same plant, not requiring an opposite sexed plant nearby to produce viable seeds. Making it a more invasive plant, for obvious reasons). It might be a c. equestifolia subspecies incana, which has thicker needles. 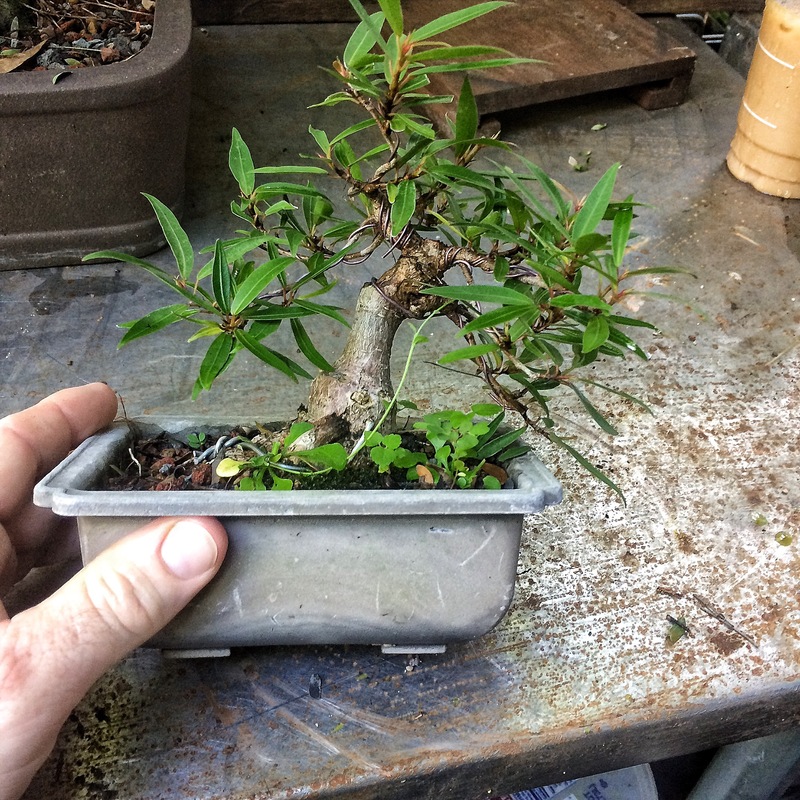 It’s also not the best species for bonsai as the foliage is so coarse and doesn’t get very dense except with lots of work. I’m getting there. This tree belongs to a friend who challenged me and said I couldn’t get the foliage pads dense. Uh huh. Don’t ever say I can’t do something. 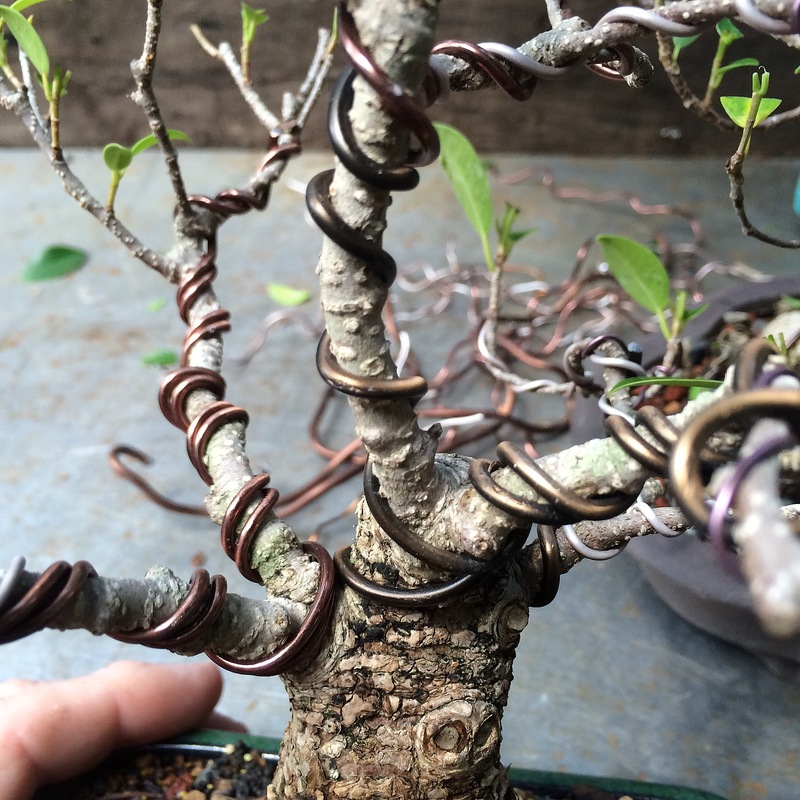 I need to repot and wire out some of the newer growth. Tomorrow. Today, my tree. 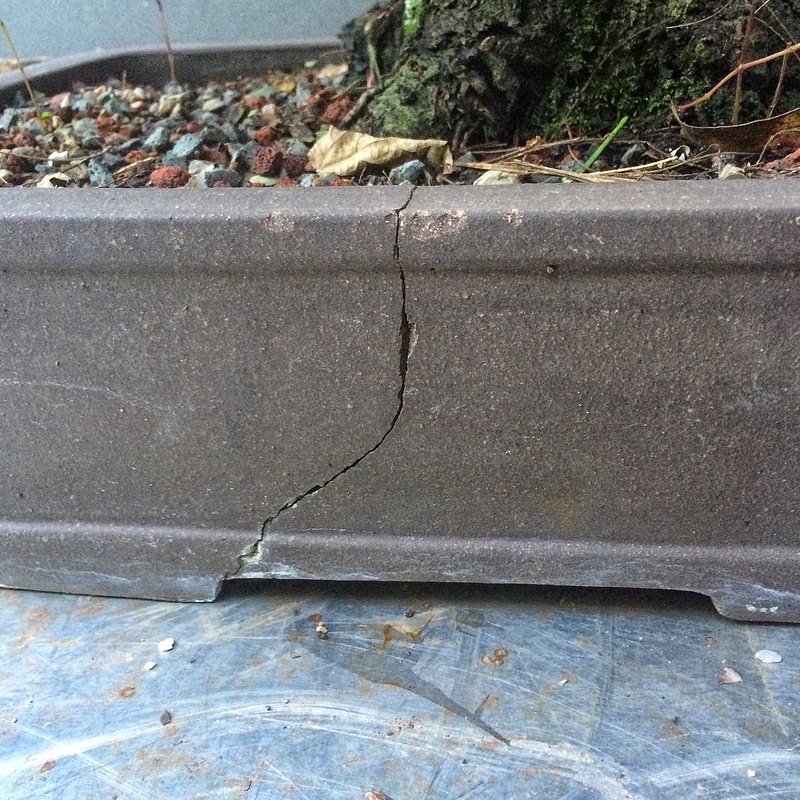 A cracked pot, like me. Here’s another tidbit. 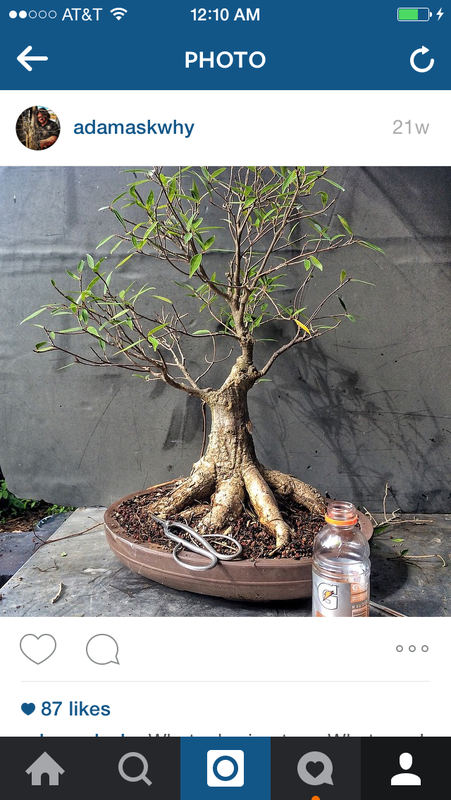 Just like the Brazilian Raintree, it too has a nitrogen fixing bacteria that creates nodules on the roots (not getting some of the soil the tree is growing in might be a reason for the poor success rate when collecting). Here’s the before trimming pic. 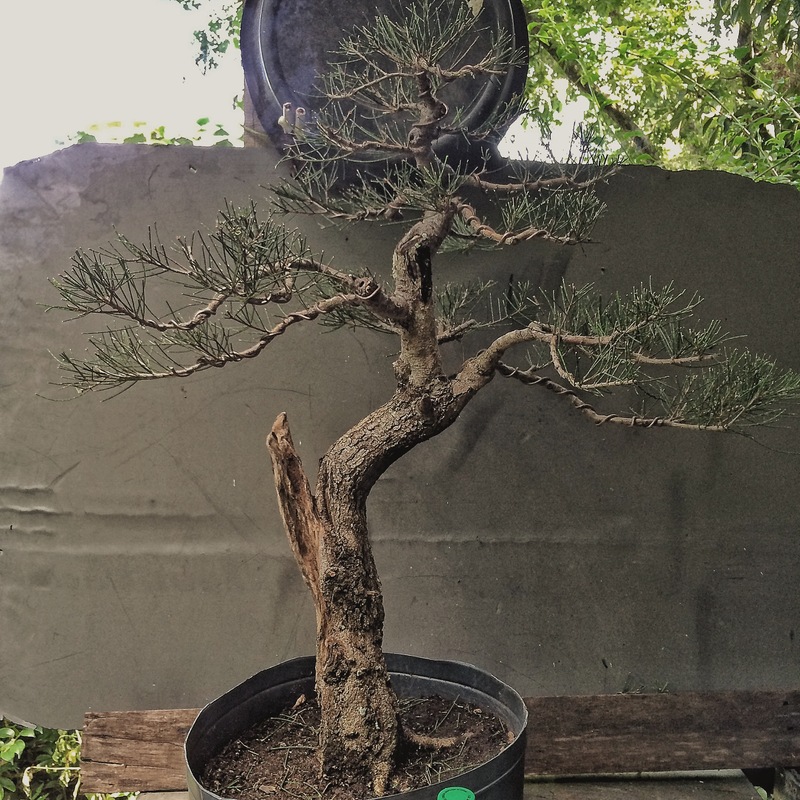 After repot. And there’s just one more branch I don’t like. 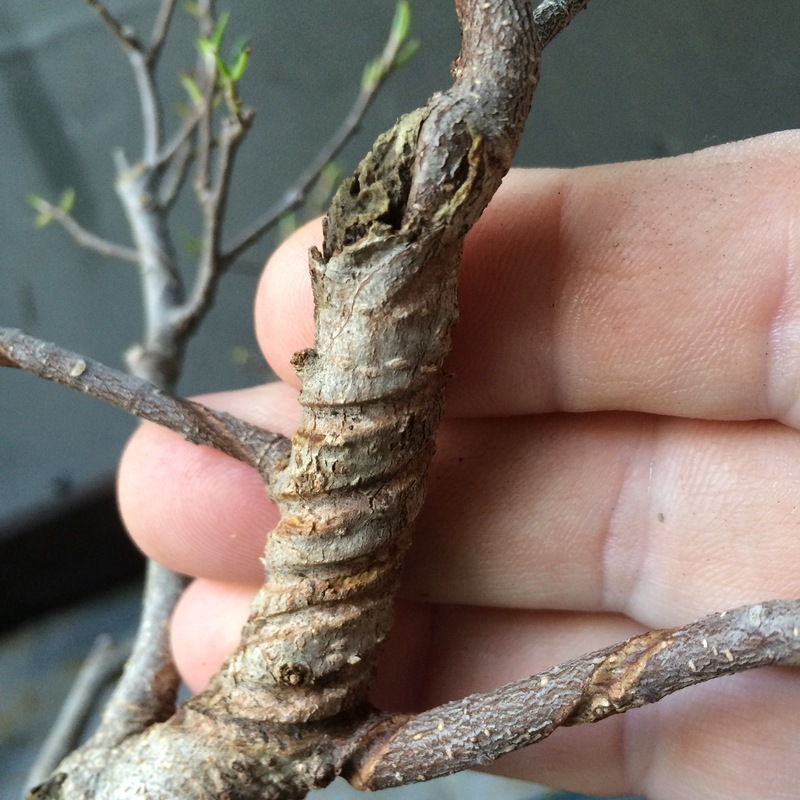 It’s too curvy compared to the other branches. That’s better. Just a few more years. As to the forbidden nature of the Aussie pine (I bet I’m driving the Australian readers crazy by me keeping calling it that. 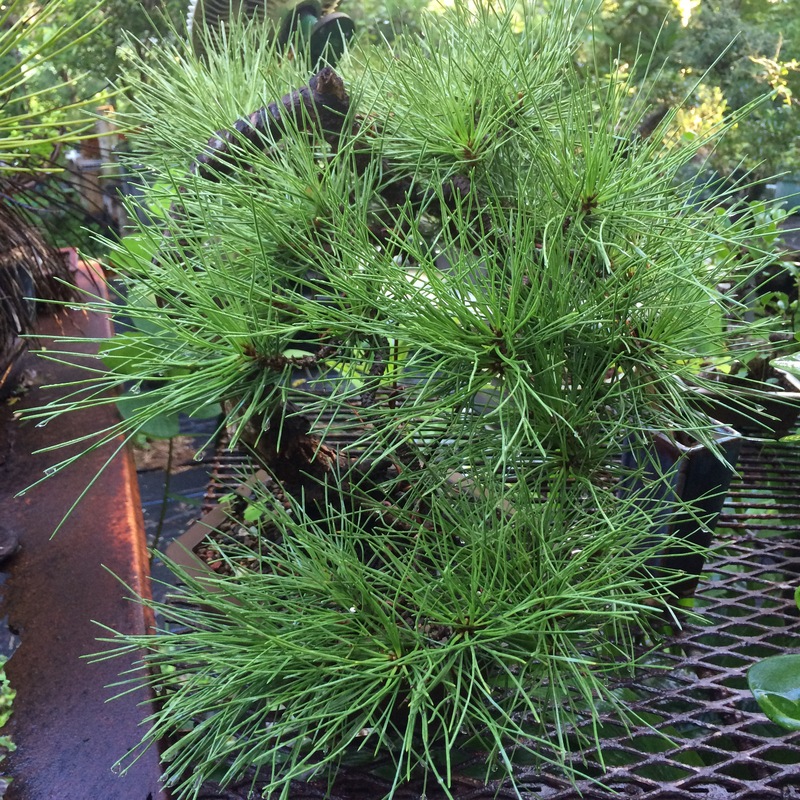 I wonder if they call it a Florida pine? ), it’s not actually against the law to own it as an individual. You can’t move it though. Florida, being the big agricultural state we are, has a good grip on the movement and sale of plants. Technically it’s against the law to sell any plants without a nursery license or, get this, to even give them away. And that’s how they can regulate and put plants on the invasive list. But, since I have a nursery license, that means I can’t sell or transport them (except to orange groves for the purpose of a windbreak). 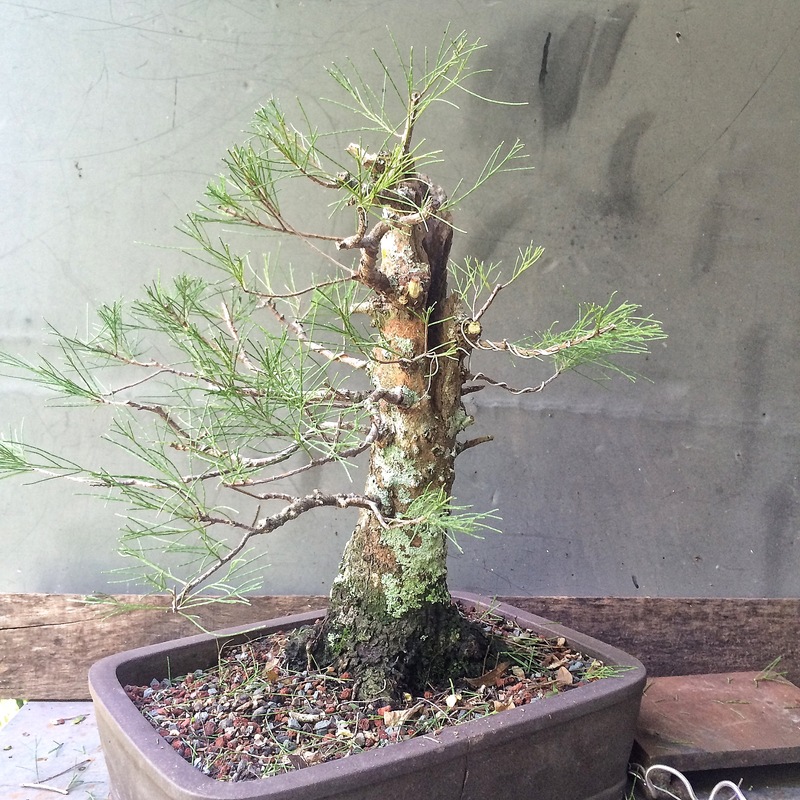 Wait ’til my friend finds out that his tree is stuck at my nursery forever. Bwahahaha! Maybe I have time to wire his tree. 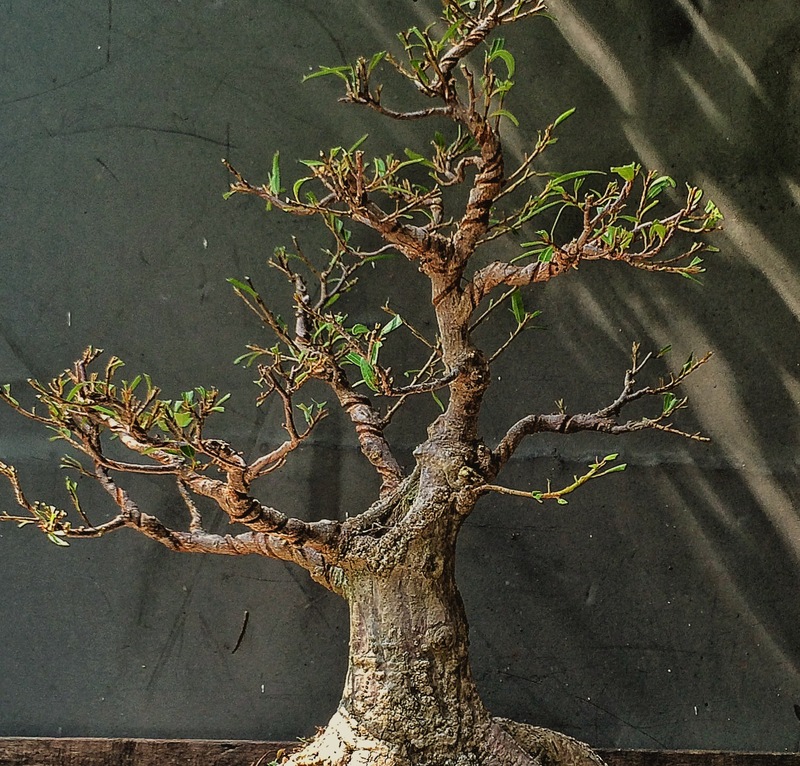 It needs repotting and deadwood treatment and all that, but that can wait. 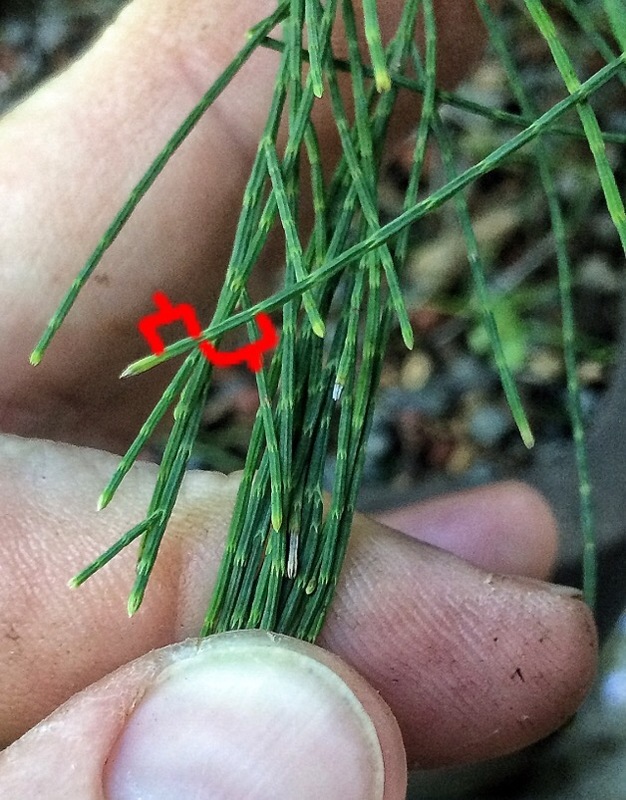 I bet that all those real pine growers wish that just by trimming the needles they could develop ramification that easily. 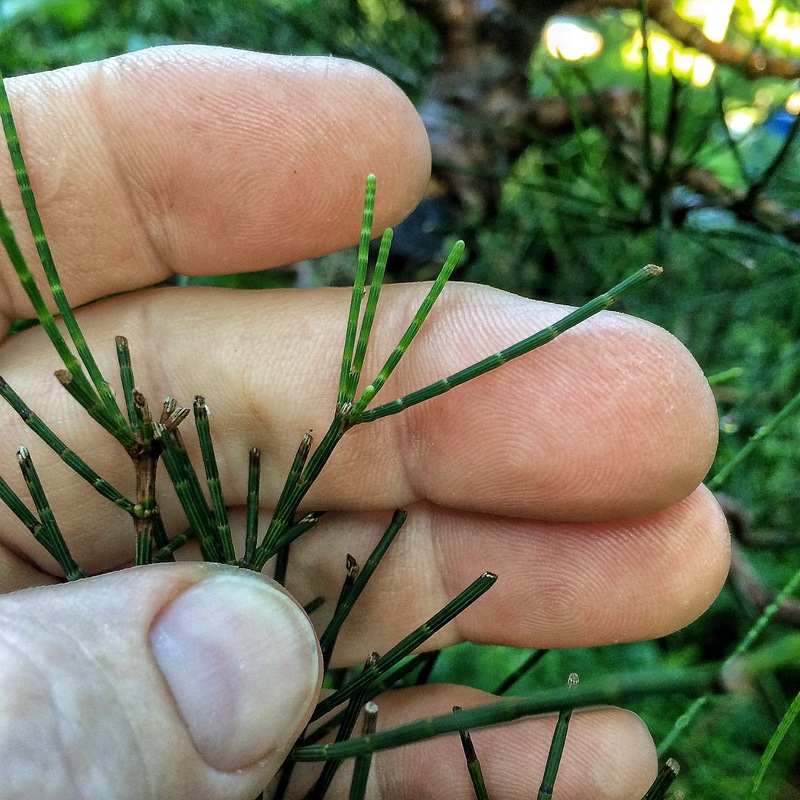 Oh, that reminds me, my Japanese black pine needs some serious needle plucking. But that’s for tomorrow too. 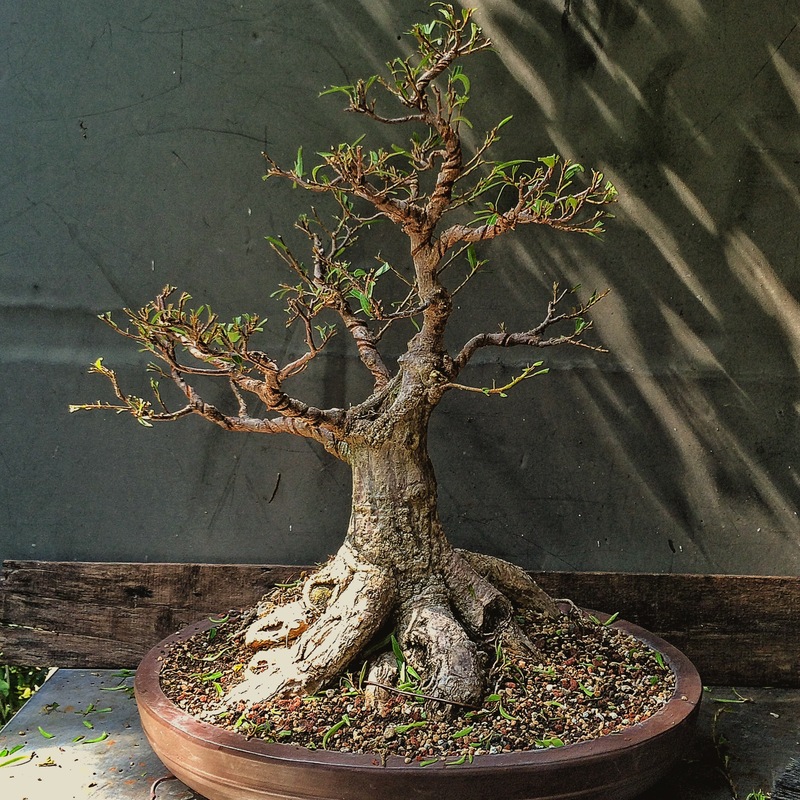 And the blog you want to learn about that is Jonas Dupuich’s Bonsai Tonight. He’s an expert on them and I turn to his pages for info on Jbp. 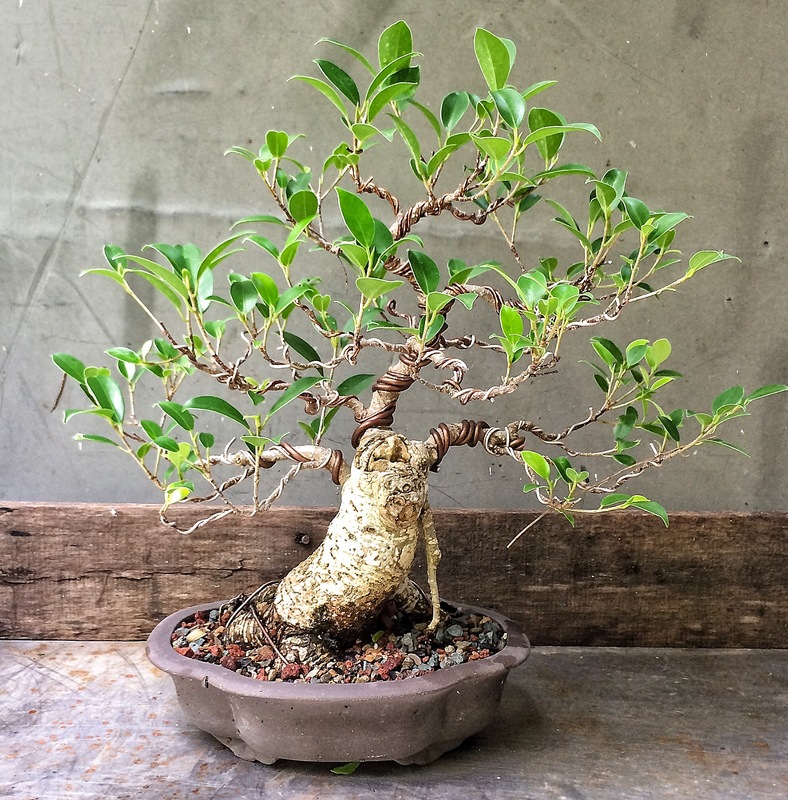 Me, I work on ficus. 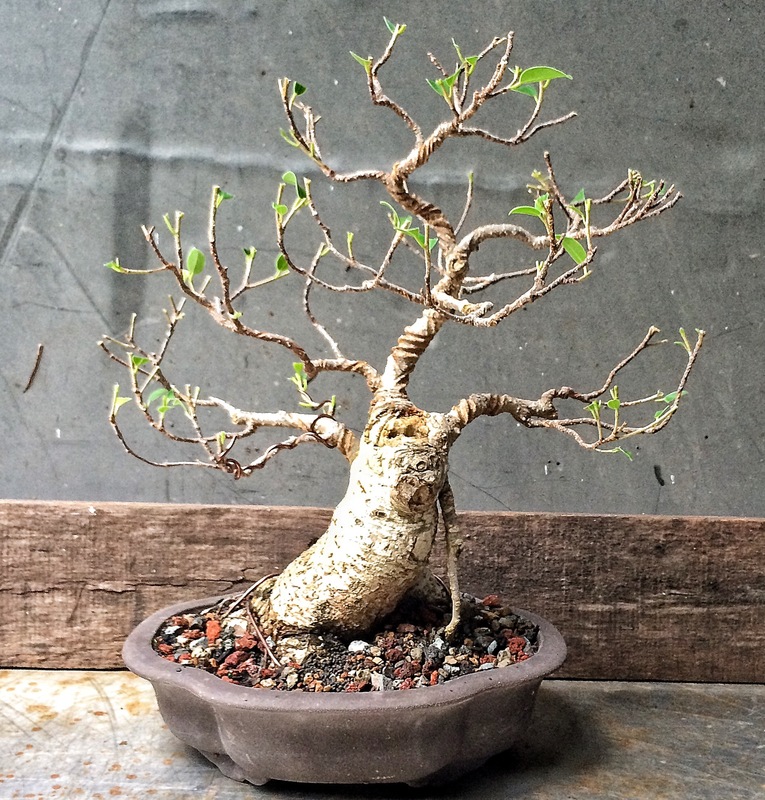 Case in point: one last ficus salicaria in development. I wired it last season. I think a little spiffy-ing up is in order. And with that, I am done for today. I’m making tacos for dinner tonight, gotta get to cutting up the onions and tomatoes and pressing the tortillas. Adios ya’ gringos!